I don't know if this is a problem everyone have, but i find it annoying that when i have to start or stop the Axapta AOS service, then i have to start the Service Manager and find the right service in the long list of Windows services. So i made this little tool for the task. 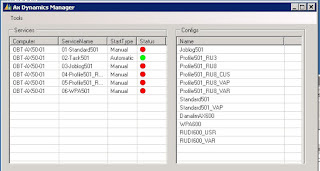 It simply looks at the list of services on the machine for any Axapta AOS service, and displays them in a simple list. To start or stop a service you simply double click on the service. If you have any comments on the program or perhaps an error, please let me know in the comments.